You know the picture…. You’ve it all worked out in your head. You know what you want and you’re just looking for something a bit different! You’ve turned up all guns blazing for hours of action ahead only to find out the that you forgot to bring the one piece of equipment to protect yourself!!! 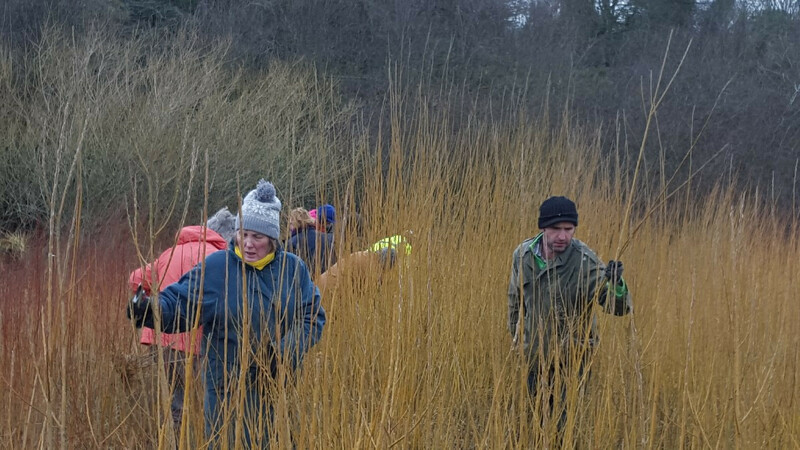 So you can imagine the disappointment of some people, who turned up for the willow workshop without their wellies, not realising they would be gettin' down and dirty! Wellies or no wellies everyone made the most of the morning and didn’t let the wet ground stop them getting outside to visit the willow beds and enjoy the beautiful views of the countryside and the Mourne Mountains in the distance. The first morning of the willow workshop course started with a site visit to Patricia Fuentes willow beds. Everyone learned about growing, harvesting and selecting the right willow for various purposes. There was a great turn out and such a lovely group of people. I’m really looking forward to getting to know them all better over the next few weeks. I feel so blessed to do the job I do. I get to meet the most interesting, down to earth, humble people, who are a joy to spend time with. I often come away inspired by the people I meet during the workshops. The atmosphere and chat is always so relaxed when people are enjoying themselves through their creativity and having a go at something new. The chat over a cuppa and some homemade goodies is a lovely way to end a creative morning.